Toddler Lifespan is 7 days. Create Household: Start by creating at least one Young Adult in CAS with any chosen looks, traits and Aspiration. The sole job will be primary caregiver for the Toddlers. They may not have a job outside the home. Money can be raised by Painting, Writing, Crafting, Gardening or Collecting in their local area. 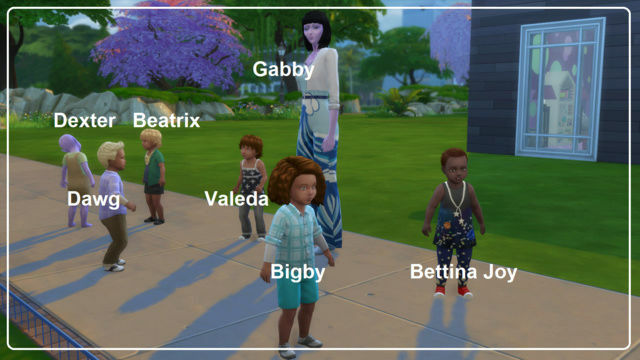 Toddlers can be created in CAS or adopted in game. Household Options: A second Young Adult/Adult can be created in CAS or added later by asking to move in or by marriage. This additional Sim will be allowed to have a career if you choose. **Nanny can be used if finances allow. **Butler can be used if finances allow. Challenge is completed after at least 7 Toddlers become Children. Hard: AKA "Total Insanity" Start with one Caregiver and 7 Toddlers. Caregiver cannot work outside of home. Train up all 7 Toddlers to learn all Toddler skills. Note: Hard mode may not be possible and could lead to Caregiver (and player) to run from room screaming and pulling out hair. Just go quietly with those people in the white coats for a nice rest. Medium: One Caregiver and 6 Toddlers with a second Sim to provide financial support. Train up all Toddlers to learn all Toddler skills. Easy: One Caregiver and at least 2 Toddlers. A second Sim can be added for financial support. Add more Toddlers by adopting or having your own. There is an open issue at AnswersHQ that results in Sims created fresh in CAS are aleady starting to age. The toddler stage is only seven days on normal lifespan. Starting with aging off is allowed due to the aging glitch. This will allow the full seven days to maximize the toddler skills. The toddler(s) can be aged up after the first seven days. At that point aging can be turned on again to continue to play. You are invited to go to this link and tick the "Me too" button. Note: Hard mode may not be possible and could lead to Caregiver (and player) to run from room screaming and pulling out hair. Just go quietly with those people in the white coats for a nice rest. 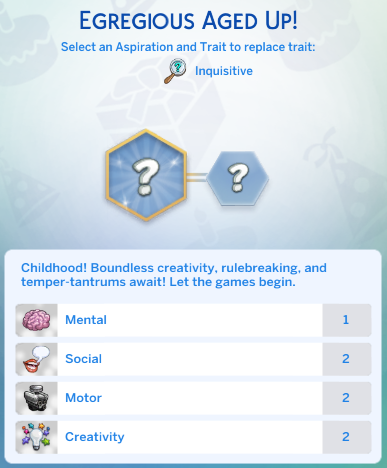 Reward Traits for Child Sims who age up from Toddlers. Specific skill requirements are needed for these traits to be rewarded to children. I will have to look this over and of course try this as soon as possible! Maybe on Monday when I have some "alone time". Bonnie and Clyde have moved into Rustic Residence in Windenburg along with their two toddlers, Nortorius and Egregious. Wish them lots of luck in completing this challenge. Dos names! Nortorius and Egregious love them! Ready for the next pair (I think) plus a roommate to help out. Potty training - Mastered "whoot!" Okay, so my family had a baby. Scurrilious Barrow who is silly. Now the toddlers can't be bathed. Luckily I had seen this Can't bath toddler @Crinrict's Sims4 Help Blog. Anyway, my sims don't have enough money to add a second or basement level to move the crib to but I did put the crib outside and that allowed my sims to bath their stinky toddler. Good plan with putting it outside. For this challenge in particular it is a good idea to use a one floor plan home. Oh and at one point I had 2 Simoleons! Had Mom run out back to gather a frog and some rocks to sell. I don't know if it's just on my end, but the forum seems to be loading rather slow today. Anyway, hat's off to both of you brave ladies for taking on this challenge! I read the challenge and decided, "Oh no. Not for me." I'd be the player running out of the room crying like a baby and hiding under the covers. Well, we all survived and my Caregiver is now so happy the toddlers have aged up that he had a full night's sleep! lol They all aged up so fast that I didn't have a chance to write down their final results. 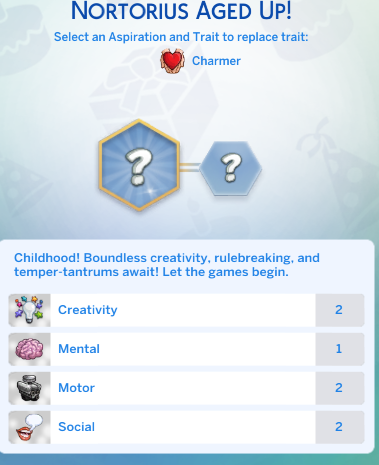 Two of the seven toddlers got the Happy Toddler bonus trait when they became a Child (Silly Toddler and Clingy Toddler) None of them maxed all the toddler skills, but my Independent toddler was the closest with everything maxed except the thinking skill. Next came the Clingy one -- can you believe it -- with all but the thinking skill again. Some toddlers weren't fully potty trained. The toddler that was the hardest to train was the Inquisitive Toddler. Here are some tips that I found helped. Hired a service sim to cook. 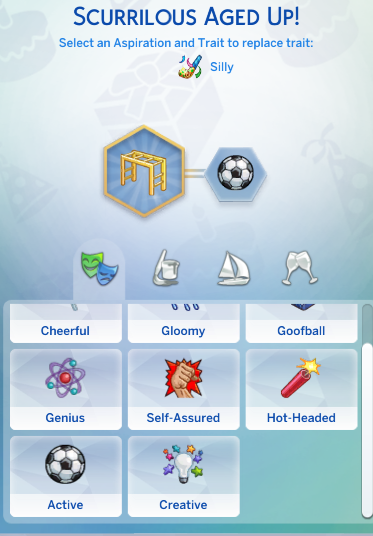 This saved my poor sim tons of time since they kept passing out because they were tired all the time. The cook also cleans up dirty dishes and potties, so saves funds on a maid. When my Caregiver sim did cook, they made the party size meal and the toddlers could help themselves. Hired a nanny once, but she just stood there for the longest time and only seemed to help one child, and the maid ate my food. So, better to hire a cook. Best tip is to invite your friends over all the time, have the toddlers talk to them, and then the toddlers can ask them to read them a story, help go potty, and help take bath -- because these toddlers get stinky. Yes, invite your friends over, lock the doors to keep them there while your poor caregiver sim tries to get some sleep or take a shower. lol Also, when I furnished the house, I didn't buy a stove, just a microwave and fridge, so the poor Caregiver sim didn't burn down the house. And, a coffee maker is essential. Also, don't make the house too large, and you don't need 7 highchairs. If the toddler is not put in a highchair, they just eat their food on the couch or their bed. The thinking skill seems to be the hardest to max, as an adult has to help them build a tower and then use flash cards with them. That's why those friends coming over all the time is great as the toddlers can do this with them. 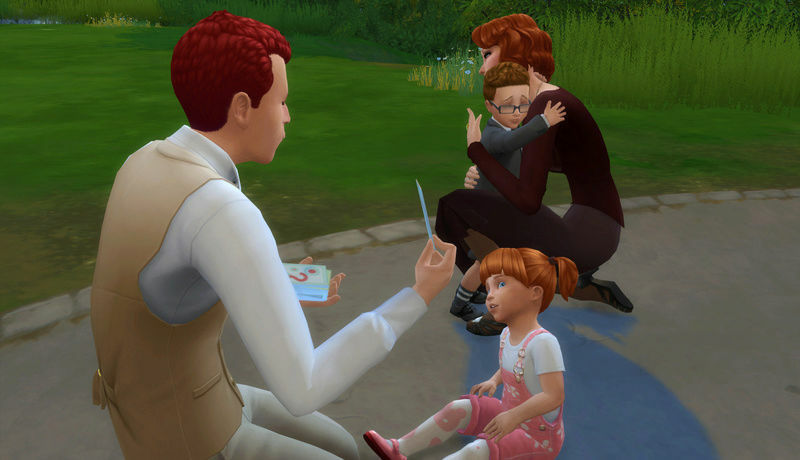 The funniest thing that happened was when my Caregiver sim decided to read all of them a story at the same time, and the little toddlers come running from all directions to come and hear the story. That was so funny! Stampede for story time! 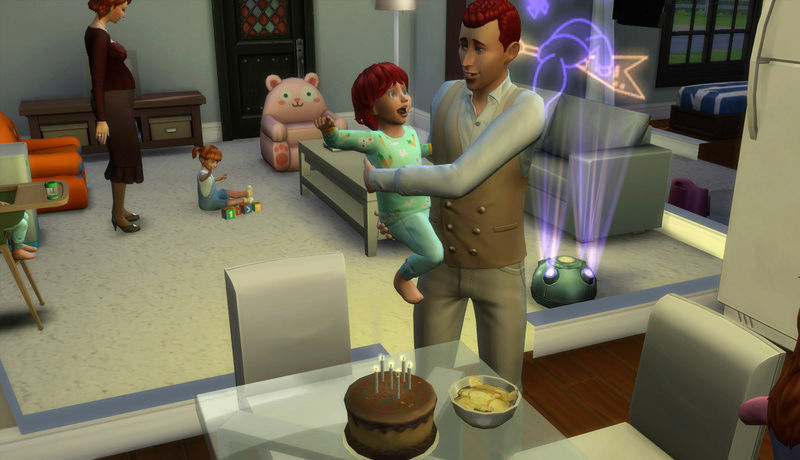 When the toddlers age up to children, you can sell all the toddler only furniture, buy new furniture, and get started on your aspiration. And maybe even leave home....my caregiver sim never went anywhere, stayed home the whole time, but was sorely tempted with those friends calling inviting them to "party at the bluffs", or some other invitation. I am going to try this challenge again, but maybe with less toddlers. lol Thanks for the great challenge! Ooooooooooooo......did you age down your famous sims to toddler?? Oh nuts....I took the wrong capture ....oops. Wednesday and all are alive. Needs are RED and caregiver is crouched in a corner rocking back and forth while gently sobbing.